Does Prologis Inc (NYSE:PLD) represent a good buying opportunity at the moment? Let’s briefly check the hedge fund interest towards the company. Hedge fund firms constantly search out bright intellectuals and highly-experienced employees and throw away millions of dollars on satellite photos and other research activities, so it is no wonder why they tend to generate millions in profits each year. It is also true that some hedge fund players fail inconceivably on some occasions, but net net their stock picks have been generating superior risk-adjusted returns on average over the years. Is Prologis Inc (NYSE:PLD) ready to rally soon? The best stock pickers are becoming hopeful. The number of long hedge fund positions improved by 5 lately. 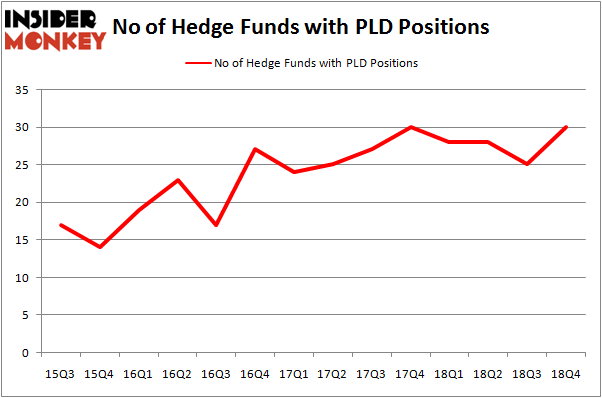 Our calculations also showed that PLD isn’t among the 30 most popular stocks among hedge funds. Let’s take a peek at the latest hedge fund action encompassing Prologis Inc (NYSE:PLD). Heading into the first quarter of 2019, a total of 30 of the hedge funds tracked by Insider Monkey held long positions in this stock, a change of 20% from one quarter earlier. By comparison, 28 hedge funds held shares or bullish call options in PLD a year ago. With the smart money’s capital changing hands, there exists a few key hedge fund managers who were increasing their stakes considerably (or already accumulated large positions). The largest stake in Prologis Inc (NYSE:PLD) was held by AEW Capital Management, which reported holding $94.9 million worth of stock at the end of September. It was followed by AQR Capital Management with a $65.9 million position. Other investors bullish on the company included Balyasny Asset Management, Renaissance Technologies, and Adage Capital Management. Now, some big names were breaking ground themselves. 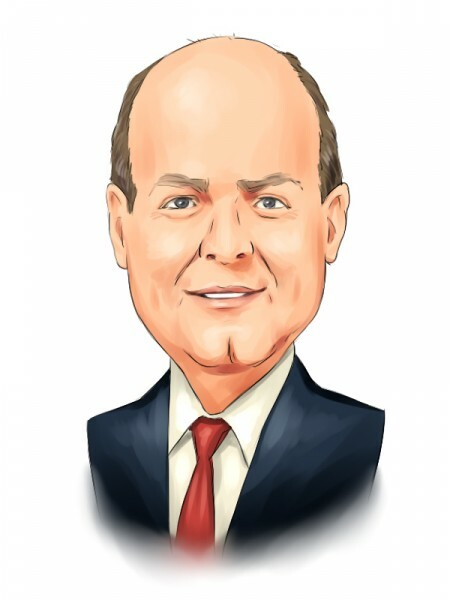 Balyasny Asset Management, managed by Dmitry Balyasny, assembled the most valuable position in Prologis Inc (NYSE:PLD). Balyasny Asset Management had $61.1 million invested in the company at the end of the quarter. David Costen Haley’s HBK Investments also made a $4.6 million investment in the stock during the quarter. The following funds were also among the new PLD investors: Jeffrey Talpins’s Element Capital Management, Jim O’Brien and Jonathan Dorfman’s Napier Park Global Capital, and Peter Rathjens, Bruce Clarke and John Campbell’s Arrowstreet Capital. Let’s check out hedge fund activity in other stocks similar to Prologis Inc (NYSE:PLD). These stocks are American Electric Power Company, Inc. (NYSE:AEP), The Sherwin-Williams Company (NYSE:SHW), Cognizant Technology Solutions Corp (NASDAQ:CTSH), and Keurig Dr Pepper Inc. (NYSE:KDP). This group of stocks’ market caps match PLD’s market cap. As you can see these stocks had an average of 36.5 hedge funds with bullish positions and the average amount invested in these stocks was $1418 million. That figure was $477 million in PLD’s case. The Sherwin-Williams Company (NYSE:SHW) is the most popular stock in this table. On the other hand Keurig Dr Pepper Inc. (NYSE:KDP) is the least popular one with only 21 bullish hedge fund positions. Prologis Inc (NYSE:PLD) is not the least popular stock in this group but hedge fund interest is still below average. Overall though hedge fund sentiment towards the stock is near its all time high. Our calculations showed that top 15 most popular stocks among hedge funds returned 19.7% through March 15th and outperformed the S&P 500 ETF (SPY) by 6.6 percentage points. Hedge funds were also right about betting on PLD as the stock returned 22.9% and outperformed the market as well. Were Hedge Funds Right About Selling Northrop Grumman Corporation (NOC)? Were Hedge Funds Right About Getting Into Bank of Montreal (BMO)? Were Hedge Funds Right About Dumping FedEx Corporation (FDX)? Were Hedge Funds Right About Ecolab Inc. (ECL)? Is Illinois Tool Works Inc. (ITW) A Good Stock To Buy? Is Vertex Pharmaceuticals Incorporated (VRTX) A Good Stock To Buy?